“ Art, for me, has a deeply human ambition, in the most positive sense. Dying can also be art. in which we dissolve, to then be dead. A task that lies in store for each of us. " For years, I have a dreamed of a room in which people can die in peace. It's a simple room: flooded with light, with a wooden floor. 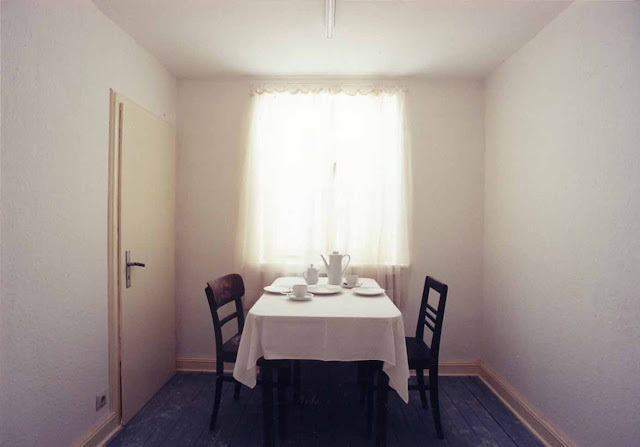 It is a copy of a room I once saw at the Museum Haus Lange-Haus Esters in Krefeld, Germany; a marvellous piece of classically modern architecture that concentrates on the basics. I have recreated this room - as an artist, that is what I do - and at the moment, it is standing right here in my studio. Any minute it could be dismantled, put on a plane and reinstalled anywhere in the world, for someone nearing the end of their days and who wants to die in a humane and harmonious environment. I'm not a naive person, but I don't think there is anything wrong or perverse about this dream. I think it's quite innocent. So it has been rather a shock to me that for the last week I have been receiving death threats by phone and email. It started at the beginning of the week, when I mentioned my project about death and dying in an interview with a reporter from the Art Newspaper. I didn't think much of it, as I have talked to curators about this at length since 1996, and there have been several mentions in exhibition catalogues. The reporter was very interested and wrote an article about it. Two sentences from this article have been quoted repeatedly: "I want to display a person dying naturally in the piece or somebody who has just died. My aim is to show the beauty of death." I did say those things, and I still mean them. Of course I expected reactions. But I didn't expect that quite so many publications would quote me without putting the statements into context. Within a few days, thousands of articles appeared across the world relying only on these two soundbites. In a way, I am not surprised that they have triggered some absolutely horrific images in the heads of journalists and readers. And yet I am still astonished by the nature of the comments I received, and disturbed by their vulgarity and violence. I received threats in multiple languages, some of them absurd, some of them seriously threatening. Someone emailed to suggest I should be "slaughtered" and given "the Jesus treatment". Someone else emailed: "Why don't you kill your mother and show her to us while he's [sic] dying?" Another told me my artworks were "degenerate". The reaction in Britain has been more balanced - I guess people find it easier to talk and even laugh about death there. After Damien Hirst and the Young British Artists, perhaps they are more used to artists pushing a few boundaries as well. The irony is that I have never been the type of artist who courts controversy for controversy's sake. I was trained as a painter; my first exhibition of paintings was in 1985. Even back then I was fascinated by the portrayal of inner spaces in art: rooms you cannot enter, places that cannot communicate with the outside world. Gradually I realised that sculpture, and eventually architecture, enabled me to investigate this fascination in a more direct way. Nowadays I mainly build and recreate rooms. Of course I am not the first artist who is interested in death as a subject. I doubt that those who call me "degenerate" would say the same about Michelangelo's statue of David - and yet we know that Michelangelo used to cut up dead people to study their anatomy. Is that not much more shocking than what I am proposing to do? I find the public portrayal of death on TV and on the internet violent and cruel; it lacks grace and respect for the human spirit. But I don't think there is anything cruel in the reality of death in itself: there has to be more humane way of presenting it. I think our culture needs to reinvestigate the way we deal with death. It has not just become a taboo, it is something that we actively try to push out of our daily lives. People used to die within the family. These days, many die in hospitals, locked away from the public. From what I have seen with my own eyes, the conditions of dying in German hospitals are scandalously brutal and bleak. And it's not much better in Britain. When I put on my installation about private spaces in two flats in east London in 2004, I used to have to walk past the Royal London Hospital in Whitechapel every morning. One day, I saw a woman who had escaped the hospital and was screaming as doctors were treating her on the road. Was it a humane place to die? I don't think so. My very first job as a teenager was with an undertaker, here in Reydt in the industrial west of Germany. I used to carry coffins from the church to the hole in ground. It was a well-paid job, mainly because no one wanted to do it. The other people I worked with were an alcoholic and a disabled man. It tells you something about the fear we have of death that we get the people at the bottom of the social ladder to handle our dead. Shouldn't this last journey be the most intimate and personal journey in a person's life? More recently, I had first-hand experience with death when my father died. I wanted to give him a personal farewell, something that spoke of our relationship, so I wanted to design a personalised gravestone made of lead. It turned out to be nearly impossible: there are so many rules. In my view, the dying should be able to define the rituals and sites of their funeral themselves. I grew up in a Catholic environment - I was even an acolyte in my local church for more than five years. My feeling is that the church used to provide us with rituals and ceremonies appropriate for death, but in a secular age, don't we need to create our own? For my project, I am not proposing that I would bring about someone's death, or stage it. Nor am I suggesting that I would encourage someone who wants to take their own life. All I want to do is offer a room, a space in which they spend their last hours as they wish. Whether it is a public event or a private event, that is entirely up to them and their relatives. I have also considered building a room for giving birth in. But I'm not sure there is much of a need for it; I have seen the sort of rooms people give birth in these days, and they are fine. Husbands are encouraged to take part in the process - everyone works together to make it a positive experience. I would like it if we can make a death a similarly positive experience. Not all responses to my project have been negative. The Jesuit priest Friedhelm Mennekes has supported my project. He feels that there is a need to engage in a serious way with death, to show it as it really is. And there have been emails from people who have expressed interest in taking part. I don't know if I will get back to these people yet, but the project will go ahead. There is one person in particular I could imagine working with. Of course, no one can tell when it will happen - that's the deal with death. To those who call me a coward for not putting myself up for the project, I would just like to say: when my time is up, I myself would like to die in one of my rooms in the private part of a museum. I live for my art, so I would like to die surrounded by art too. My aim would be to find a way of death that is beautiful and fulfilled: I couldn't image a better place than a gallery to do so.